Penn advises clients in real estate transactions, ranging from the complex to the routine, involving the acquisition, financing, development, and sale of multi-family (including student housing and traditional), retail, office, warehouse, mixed-use, and hotel real estate matters. In 2018, Penn represented clients in the purchase and sale of a variety of assets totaling more than $400 million. A substantial portion of Penn’s practice focuses on representing landlords and tenants in preparing and negotiating leases for retail, office, industrial/warehouse, and medical office properties. Currently, Penn represents landlords in the leasing of their office, retail, and industrial portfolios totaling more than one million square feet spanning more than a dozen buildings and shopping centers. 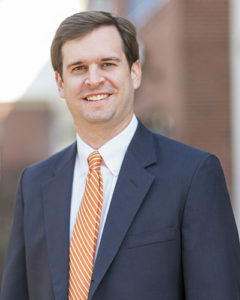 Prior to joining the firm, Penn practiced in the Charlotte and Raleigh offices of a large international law firm and served as temporary law clerk to the Honorable G. Steven Agee, United States Court of Appeals for the Fourth Circuit.